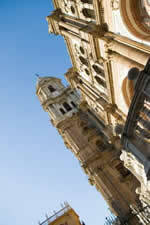 Cadiz Spain is thought to be the oldest city in Europe. 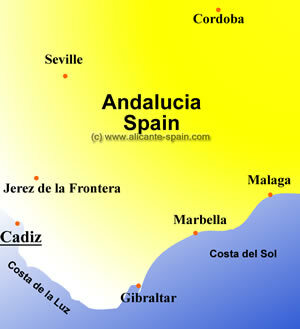 The emplacement of the city of Cadiz is supreme. It is like a tongue stretching out into the Cadiz bay, which forms a fortified peninsula connected to firm land. Under the Phoenician rule it was called Gadir. Unlike other cities nowadays, Cadiz appearance remains old, quaint but very kempt. As other Andalusian cities, it stands out for its Moorish architecture, narrow cobbled stone streets and the easy going personality of the south. Under the name of Gadir, given to it by the Phoenicians, Cadiz started out as a magnificent trading post in 1100 B. century, trading tin, silver and amber. Later it was used by the Carthaginians converting it into a busy port city. After being reigned by the Moorish in the 16 th century, Cadiz started to prosper as having the best stategic point to make trade with the New World. Columbus sailed from this point to America on two of his voyages. It was in the 18 th century when Cadiz grew the most. It was the scene of important battles and threatening situations such as the invasion of Sir Francis Drake or the struggle against the near capture by Napoleon. A few years later, the Provincial government set down the Liberal Constitution in 1812, Spain´s first constitution. Since then up until now, Cadiz´s liberal and jovial spirit lasts on. 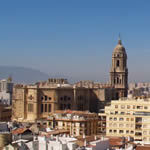 To get the feeling of the historic atmosphere of Cadiz, a short stroll to the New Cathedral with its splendorous golden tiled dome gives us one of our first glimpses of the main artistic buildings. The magestic covered dome and the rest of the structure is from the 18 th century Baroque era and can be best seen from the outside. The cathedral is perfect to enjoy the real essence of tranquility and calmness. But on the lower floor, if you situate yourself in the middle of the round basement, the echoing effect is mind-boggling. You will be dazed when seeing the collection of church values and the the resting place of the well-known music composer Manuel de Falla in the solemn crypt. Continuing on through the charming old quarters we must make a stop at the Fine Arts and Archaeology Museum. There is an eye-opening collection of pottery, crocks, jugs and glassware typical of what used to be in use in a fishing port. Stunning paintings belonging to their best period of two unforgettable Spanish painters: Rubens and Zurbaran. Another interesting temple of worship is the Oratorio of Santa Cruz. Two very different areas are visible here. On the first floor there is a very sad looking 18 th century chapel with a crucifix but on the upper floor we have an ornately decorated church which seems as if ´it has been dropped from the clouds´. Once again you cannot miss the opportunity to see some of Goya´s religious canvases. 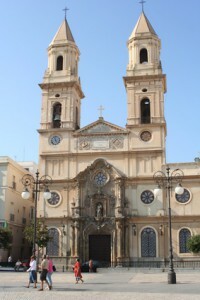 With a little touch of political hue, we fix our eyes on the Church of SaintPhilip Neri. It seems a strange place for an anti-monarchial parliament to gather to write up a liberal constitution in 1812, revoking the ruler Joseph Bonaparte Pepe Botella. Another famous painter, Murillo, left his beautiful masterpiece The Immaculate Conception to be shown on the central altar. A lofty watchtower, the Tavira Tower, one of the highest and most important of all the 165 towers which used to over look the Cadiz. The boardwalks all around the ports and bay offer views without comparison. The bay is lined with parks that make up a luminous spectrum which dazzle the passing byers. The heart of Cadiz beats with the soothing rythm of the bay area´s relaxed ambience. One of Spain´s most extensive Natural Parks, Donana, is located on the basin of the River Guadalquivir, just heading towards the north from Cadiz, between Huelva and Seville. You do not have to be a nature lover to be attracted to this eye-catching wildlife wonderland. The magnetism of this natural ecosystem lies in three areas: the complex becahes, live moving dunes and the swamps or marshes. The later is an enormous flat flooded extension in the winter and spring which therefore serves as a refugee habitat and natural feeding ground for birds; the most distinctive one being the flamenco. On the other hand, we are stunned by the forest area which hides the well-known lynx. Thanks to the evolution of the species which are found here, Cadiz has proof of what we mentioned before as being the oldest city in Europe. The most beautiful white villages is the name so adequately given to the two villages of Arcos de la Frontera and Grazalema. erred to, we can come in contact with kilometers of neat, tidy beaches with their corresponding villages such as Chipiona, San Fernando and Rota, only having unlimited rolling sandunes in sight behind you and the clear blue Atlantic Ocean in front. Cadiz would not be Cadiz if it did not have the festive tradition of Carnival. 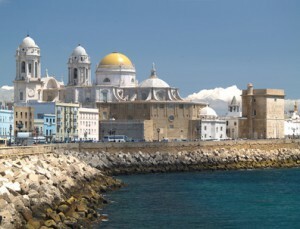 Similar to Venice in as much as its dependence on the importance of being a port town and having been closely linked with it in trading in the 16 th century, Cadiz has joined Venice in this celebration. These festivities begin with processions and parades one weekend before the fixed date depending on when Shrove Tuesday is and ending the weekend after. Everyone can participate one way or another, with costumes and masks or just freeing the adreneline and being sociable. The best is when groups of men excentically dressed sing their melodic criticisms of what has been happening in and around Cadiz, Spain and the world. The final competition is held in the Manuel de Falla Theatre. There are all kinds of Queen of the Carnival contests. So much activity deserves to be prized, and what better way to do it is to sit down to a hearty meal. Being as Cadiz is so close to the sea, it offers fresh oysters, squid, clams, sea snails, cockles and shrimp to mention some. The Dog crock caldillo de perro is deliciously elaborated with onions, hake, and tart orange juice. The Cabbage Stew is wonderfully prepared Cadiz stlye. There are also excellent game dishes, sherry style oxtail soup and kidneys in sherry. The artichokes and fried green beans are indescribable! Anyone visiting Cadiz who wishes to enjoy the wonders of this enchanting place, will profit from a be pleasant experience.